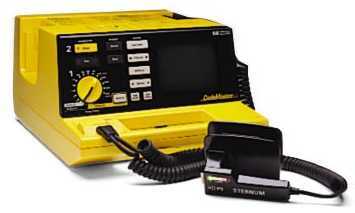 Buy or rent pre-owned, recertified Codemaster Defibrillator you need today. All pre-owned medical equipment is patient ready equipment and is covered by an OEM matched warranty. Standard paddles are anterior/anterior, adult and pediatric. Adult electrodes slide off to expose pediatric electrodes. Paddle cord is 10ft. 5 in diagonal CRT for 4 seconds of ECG data on screen; non fade, fixed trace. Scrolling trace is selectable.